Snapshot for May 14, 2008. This month’s crop of new college graduates will confront a more inhospitable job market than their predecessors faced in 2001, the beginning of the last recession. In particular, wage and benefit trends show that the labor market for recent college graduates (ages 23-29) was weaker in 2007 than before the last recession in 2001. 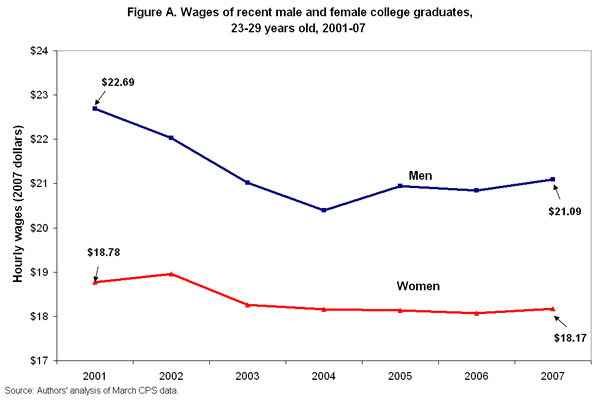 Inflation-adjusted average hourly wages for young college graduates were $21.09 for men and $18.17 for women in 2007 (Figure A). While the hourly wages for both men and women have ended their steady decline, they have barely risen and are still lower by about $0.60 for women and $1.60 for men than they were six years ago. What’s more, a college degree has become less of a guarantee of receiving health and retirement benefits on the job. 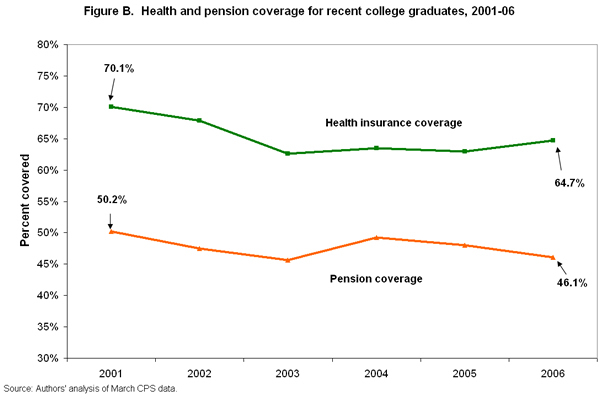 Over the last recession and recovery, college graduates in entry-level jobs became less likely to receive employer-provided health insurance and pension coverage.1 The incidence of health insurance coverage is over 5 percentage points lower than in 2001, and less than half of young college grads now receive any form of pension coverage on the job (see Figure B). The fact that new college grads are doing poorly is a troubling sign, since those with higher education and more skills required in the new economy (e.g., computer literacy) are expected to be faring well. With persistent job losses and rising unemployment expected, there is little evidence to suggest that the job market will improve for recent college graduates in the near future. 1. Based on tabulations of March CPS data samples of private wage and salary earners ages 23-29 with a substantial labor force attachment, defined as working at least 20 hours per week and 26 weeks per year. Health coverage is defined as being included in an employer-provided plan where the employer paid for at least some of the premium.